MzTeachuh: The Sky Is Cheap Entertainment: View All Five Visible Planets At Once This Month! The Sky Is Cheap Entertainment: View All Five Visible Planets At Once This Month! A great drama unfolds in the predawn sky throughout January, 2016. 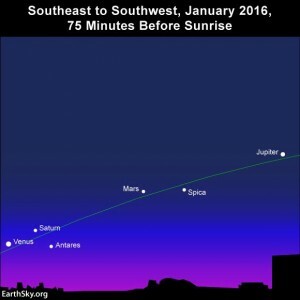 By the month’s end, all five visible planets will appear simultaneously before dawn. Very cool classical music to go along with the view.